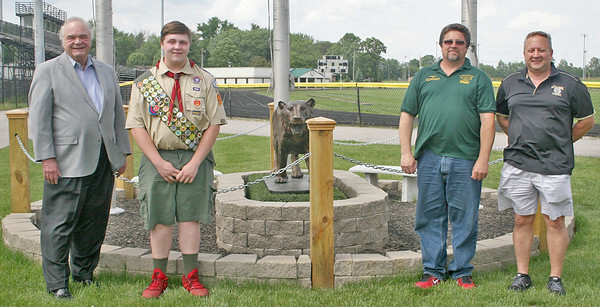 ROARING SUCCESS: From left, Witham Health Services President and CEO Raymond Ingham, Lebanon High School senior Noah Vernon, his father Robert Vernon and LHS athletic director Phil Levine gathered Friday at the south end of LHS's football field, where Noah Vernon recently completed his Eagle Scout beautification project, shown in the photo. Noah Vernon's project was funded by Witham Health Services and Kramer Lumber. The project, which includes a tiger statue and brick structure, sits beneath the flag poles, which were moved from the opposite end of the field. Vernon, who graduated yesterday with the rest of his class, said he wanted to give his school a parting gift. "I wanted to leave my mark at the high school," he said.